Another quality eBook from Chapel Library! This issue of the Free Grace Broadcaster delves into the theology of bearing children from a biblical and Puritan perspective. Babies are made in God’s image, God’s elect come from babies, and God’s promise of salvation was promised and fulfilled in a baby. “She shall bring forth a son, and thou shalt call his name JESUS: for he shall save his people from their sins” (Mat 1:20-21). Babies are important. Explore this fascinating subject with articles from John Calvin, Martin Luther, Thomas Manton, J. R. Miller, Stephen Charnock, Richard Adams, Arthur Pink, Thomas Jacombe, and Thomas Boston. Finally I get this ebook, thanks for all these Free Grace Broadcaster - Issue 224 - Babies I can get now! Free Grace Broadcaster - Issue 224 - Babies was the best books I ever buy. Free Grace Broadcaster - Issue 224 - Babies did exactly what you said it does. I will recommend you to my colleagues. 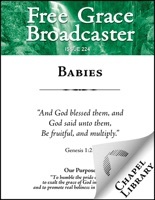 Free Grace Broadcaster - Issue 224 - Babies is the most valuable books we have EVER purchased. I'd be lost without this. I am completely blown away.